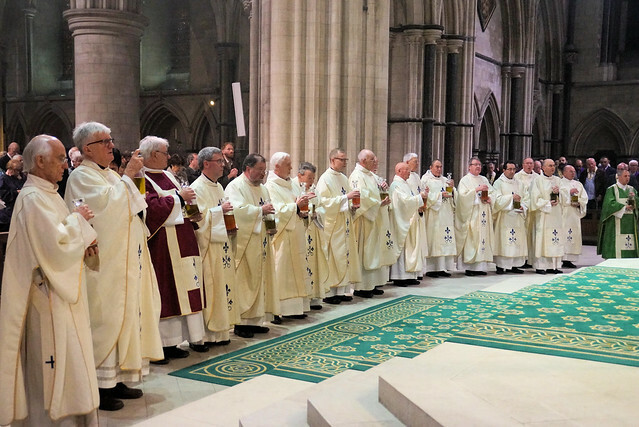 Over 1,000 people attended the annual Chrism Mass at a packed Cathedral of St John the Baptist in Norwich on Tuesday night (March 27), during which priestly promises were renewed and sacred oils blessed. Keith Morris reports. In his homily, Bishop Alan addressed the secularist challenge to the church. He said: "We are living in a time of aggressive secularism. The secularists tell us that the principles of reason, freedom and human rights are essential for progress, for a civilised society, for personal freedom and the betterment of all humanity. "For them, religion is in direct opposition to these principles – the source of all superstition, oppression and backward thinking. "The foundation they would build on for a new secular civilisation would be relativism ' the abolition of all objective truth and its replacement with subjective truth, that is – what I believe and do is right for me, whether or not that impinges on my neighbour's good or not. "This is a huge challenge for the Church, as we seek to proclaim the truth and the joy of the Gospel of Jesus Christ to every generation," said Bishop Alan. "How can we live out our faith, how can we speak about our faith to others, in a society which consigns religion to the private sphere and refuses to allow believers to speak publicly or to influence the life of that society? "We are experiencing today much the same challenges which the Apostles and the early Church experienced. They too faced the aggressive opposition to the Gospel from the world in which they lived. "Like them we too have been commissioned by the Lord, to go out to the whole world and, in spite of the huge challenge we face, proclaim his Gospel to all. Jesus gives us his promise that he will be with us as we do so. "In a few moments, the Holy Oils will be blessed and Chrism consecrated. They speak of our vocation to proclaim Him and his Gospel in our words and lives ' and they give us the strength and courage to do so. They are powerful signs of the risen Lord's presence among us today." Just before the Chrism Mass started, Eddie Francis, a parishioner from St Ives suffered a suspected heart problem and received emergency treatment from a doctor and nurses from the congregation who used a defibrillator on him before paramedics arrived and took him to hospital. Bishop Alan visited Eddie in the Norfolk & Norwich Hospital on Wednesday and gave him Holy Communion. "Eddie was very cheerful," said Bishop Alan. "His wife Pat was with him and they are especially grateful to the doctor and nurses from the congregation who were able to minister to him until the para medics arrived. We pray that his health will improve and will be able to return to his home and parish soon."